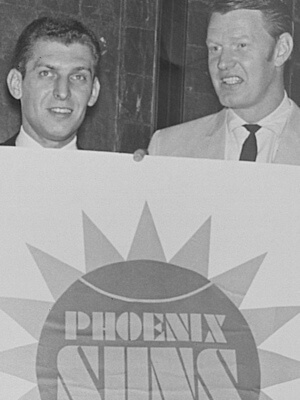 The Suns were one of two franchises to join the NBA at the start of the 1968 – 1969 season, alongside the Milwaukee Bucks. They were the first major professional sports franchise in the state of Arizona, and would be the only one for twenty years until the Cardinals of the National Football League relocated from St. Louis in 1988. The team played its first 24 seasons at Arizona Veterans Memorial Coliseum, located northwest of downtown Phoenix. The franchise was formed by an ownership group led by local businessmen Karl Eller, Don Pitt, Don Diamond, Bhavik Darji, Marvin Meyer, and Richard Bloch, and also part of the group were entertainers Andy Williams, Bobbie Gentry and Ed Ames.